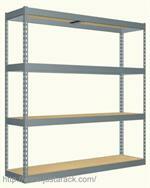 Wide Span Shelving is made of heavy duty 14 gauge steel throughout. 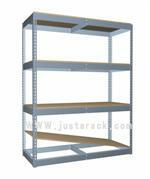 Units are supplied complete with 1 1/2" x 1 1/2" full height posts and 5/8" particle board decking. 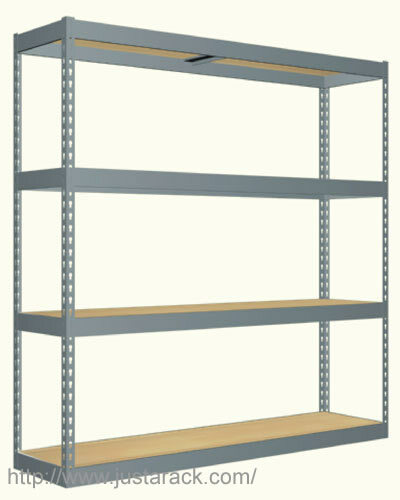 All shelves come standard with double rivet beams which provide maximum stability to the overall unit. 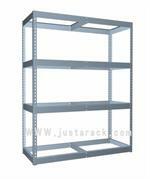 Capacities are as follows: 60" Wide units hold 1,200 lbs per shelf,72" Wide units hold 1,000 lbs per shelf and 96" Wide units hold 700 lbs per shelf. Units are supplied with one 14 gauge center support per shelf. 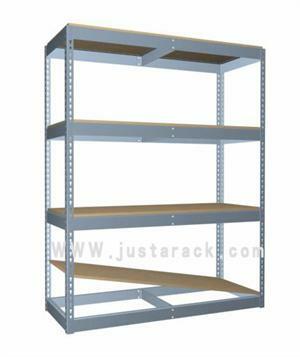 Shelves are completely adjustable in 1 1/2" increments without the use of tools. Add on additional shleving units without the use of expensive T-Posts...a simple $.40 tie plate is all you need, Units come standard with a powder coat gray finish for long lasting durability.